Rattle and Hum is a Brand New Upmarket Style 50 bed Hostel located on the Main St of Port. This is the BEST location in town, 100m walk to 4 Mile Beach, shopping, restaurants, bars, marina and markets all @ your doorstep. This stylish modern property has everything you need. A beautifully designed open-plan kitchen, lounge/ TV area that lets you experience tropical living with views of the picturesque Port Douglas by day and night. For the Sports Fans a large plasma screen showing all Foxtel and Setanta sports. Which means you never have to miss a match. We bring it to you live 24hrs a day!!!!! The rooms are modern and spacious, security swipe card system, fully air-conditioned; fans and beds are made for you with linen supplied. All privates rooms are en-suited and spacious. A large guest shower/ toilet facilities means hot showers and no crowding. 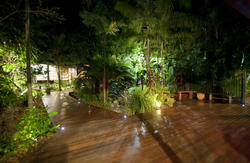 We have a beautiful outdoor deck to chill-out on and read a book.. Check the Specials as we have a 3 day and 5 day package including Return Transfers from Cairns daily. We are situated @ 38 Macrossan St, this is the main street of Port Douglas. The famous 4 Mile beach is a 100m walk from the hostel.